CIUS researchers are investigating whether a property of ultrasonic waves known as coherence can be used to detect microcalcifications in human tissue for cancer screening. In marine sonar, it has already been used successfully for detecting and characterising objects and features on the seafloor. The spirit of CIUS is for ideas to flow between the disciplines and there are several examples of concepts from medical ultrasound that have been adapted to marine sonar. However, this is a rare example of a technique which is being taken from sonar and applied to ultrasound. Wave-fields contain waves with different offsets, known as phase shifts or phases. Coherence is a measure of the “uniformity” or “orderliness” of these phases. An incoherent field has waves with random phases, whereas a coherent field has phases that are aligned in an orderly fashion. Good examples of incoherent and coherent electromagnetic wave fields are natural white light from the sun and laser light, respectively. Natural white light contains a wide range of frequencies with random phases, whereas laser light contains a narrow range of frequencies with tightly aligned phases. These examples are illustrated in Fig. 1. Fig. 1 – Illustrations of (a) incoherent natural white light and (b) coherent laser light. Ultrasonic and acoustic imaging systems emit coherent waves. However, when these emitted fields are reflected and scattered, they can become incoherent due to the nature of the medium or object. Illustrations of coherent and incoherent reflection are shown in Fig 2. Fig. 2 – An incident coherent ultrasonic wave field can be scattered (a) coherently (with aligned phase) or (b) incoherently (with random phase) leading to constructive and destructive interference. 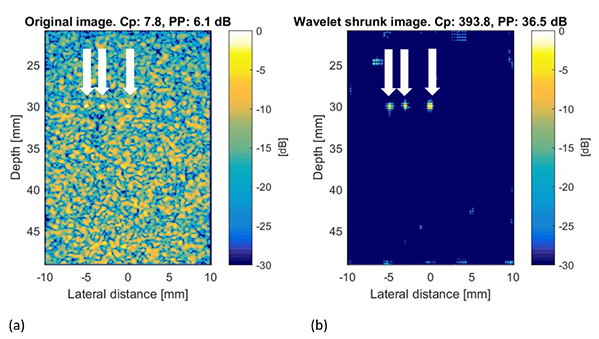 In seafloor imaging sonar, measurements of phase coherence can be used to distinguish between objects or media that are smooth / simple versus rough / complicated. The former tends to result in coherent scattering and the latter in incoherent scattering. For low-frequency sediment and object-penetrating sonar, coherence measurements offer further potential to characterise material properties and internal structure. A new algorithm was developed recently to extract coherence information from synthetic aperture sonar (SAS) images. The algorithm can separate an image into its coherent and incoherent parts. Examples are shown in Fig. 3 for images collected by the NATO Science and Technology Organisation (STO) Centre for Maritime Research and Experimentation (CMRE) using their MUSCLE autonomous underwater vehicle (AUV). Here, the coherent parts of the scene are overlaid in red, highlighting rigid objects that are resting on the seafloor. Another example is shown in Fig. 4 for an image beneath the seafloor collected by TNO (Netherlands Organisation for Applied Science) using their MUD sediment-penetrating sonar. Here, buried objects can be detected more easily once the incoherent seafloor has been removed. Fig. 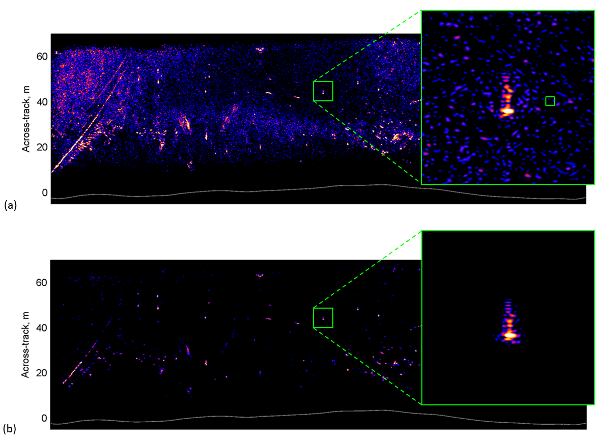 3 – Sonar images of the seafloor from CMRE’s MUSCLE AUV. The grayscale images have been enhanced with overlays that highlight the coherent regions in red: (a) shows a benign and mostly featureless seafloor and (b) shows a seafloor that is cluttered with natural debris. This figure has been reproduced from [Hunter et al., 1st International Conference on Underwater Acoustics, Corfu, Greece, 2013] with the permission of Dr Samantha Dugelay at NATO STO CMRE. Fig. 4 – A sonar image of buried objects from TNO’s MUD sonar. The original image is shown in (a) and the enhanced image with the incoherent background removed is shown in (b). A buried object can be observed in the zoomed region. This figure has been reproduced from [Hunter et al., 1st International Conference on Underwater Acoustics, Corfu, Greece, 2013] with the permission of Dr Guus Beckers at TNO. This year, PhD student Stine Hverven at the Department of Informatics, UiO, has started to investigate whether the sonar coherence algorithm can be adapted for detecting microcalcifications in human tissue using medical ultrasound. Microcalcifications in the breast can be a precursor to cancer. However, they are very difficult to detect in traditional ultrasound imagery. Our hypothesis is that microcalcifications scatter ultrasound more coherently than the surrounding fibrous tissue. Therefore, by exploiting the coherence information it might be possible to provide a better detection capability and this could lead to early detection and ultimately prevention of some cancers. Preliminary results based on simulations and medical phantoms have shown promise. A simulated example is given in Fig 5. Stine is now starting to test the algorithm on images from real breast tissue containing microcalcifications and we are eager to see the results. Fig. 5 – Simulated medical ultrasound imagery of three microcalcifications in human tissue generated using the Field-II simulator: (a) is the original ultrasound image and (b) is the coherence-enhanced image. The locations of the microcalcifications are indicated by the arrows and the potential improvement to detectability is clearly illustrated. How important is parent involvement in school?